Celebrating the life of Ronald B. Roland, Sr.
Obituary for Ronald B. Roland, Sr.
Ronald B. Roland, Sr., age 78, of Peachtree Corners, GA, peacefully passed away Tuesday, March 19, 2019. A Celebration of Life service will be held on Friday, April 5, 2019 at 11:00 a.m. in the Peachtree Corners Chapel of Crowell Brothers Funeral Homes & Crematory with Dr. David Shaw officiating. The family will receive on Friday, April 5th, 2019 from 10:00 a.m. until 11:00 a.m. at the funeral home. Ronald attended Peachtree Corners Baptist Church. Ron loved old cars, to play the trumpet, and cooking on a Saturday. 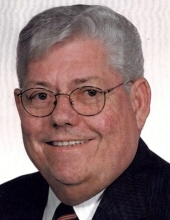 Ronald B. Roland Sr., 1961 - 1991 worked passionately and retired as Regional VP, Southern Regions for the Unisys Corporation. He is survived by his loving wife of 58 years, Amanda Roland; son, Ronald B. Roland, Jr., and spouse Rhonda Taylor; daughter, Stephanie Kay Roland; grandson, James Daniel Aycock; sister, Marion Phillips and spouse Wayne; as well as several nieces and nephews. In lieu of flowers, the family asks that contributions be sent to the Alzheimer's Association in memory of “Ronald B. Roland, Sr.”. Online condolences may be expressed at www.crowellbrothers.com . Arrangements entrusted by Crowell Brothers Funeral Homes & Crematory, 5051 Peachtree Industrial Boulevard, Peachtree Corners, GA, 30092. 770-448-5757. To send flowers or a remembrance gift to the family of Ronald B. Roland, Sr., please visit our Tribute Store. "Email Address" would like to share the life celebration of Ronald B. Roland, Sr.. Click on the "link" to go to share a favorite memory or leave a condolence message for the family.